BAXIA Technology -- Focus on designed and creative household items for an Ecology, BPA-Free and Optimization Life. Our aroma oils diffuser we made is based around improving your living environment & enriching your daily life. From Now On, Enjoy The Fragrant & Soothing Atmosphere Your Home Deserves. 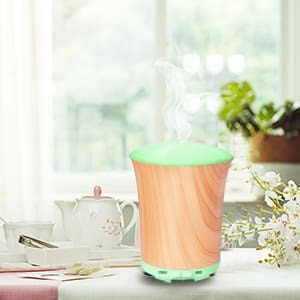 With its nice shape and unique design, the wood grain aroma diffuser gives out ultra fine cool mist with lovely fragrance to relieve yourself, offering you a simple, healthy and enjoyable way to provide moisture to your skin and keep good mood with beautiful mood light. 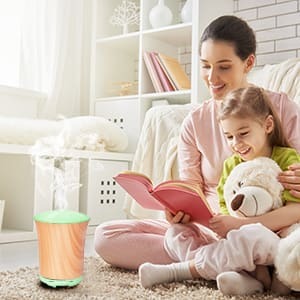 Why Choose BAXIA TECHNOLOGY Essential Oil Diffuser? Easy to set up, easy to use, built in auto shut-off, great value for the home. Advanced Ultrasonic vaporizing diffusion technology quietly releases a soothing fragrant mist up to 10 hours. And natural essential oils are never heated, thereby providing you their full benefit. Separate Control - You may use it as a night light without mist, available for bright and dim setting. Rainbow of Colors - Diffuser transforms into a 8 colorful light with the hit of button. Optional LED Lighting - Your diffuser becomes a soothing and mesmerizing centerpiece prompting contemplation. Advanced Ultrasonic Technology - Ultrasonic mist creation to release an exquisite fragrance into the atmosphere. Simple Maintenance - Easy to use and clean, auto shut off when water runs out, much safer and also extending the mist chip life. Zero Heat Process - It makes our diffuser child safe and eliminates the risk of injury or fire that candles or smoky incense pose. A perfect complement for bedroom, study, office, living room, yoga room, fitness room, conference room, hotel, etc. Position the aroma diffuser up, pull vertically upwards to remove the covers. Connect the AC adapter with power from wall socket. Add water per 100ml with 2~3 drops essential oil (Oil Not Included). Re-install the inner and outer covers. Aroma diffuser must NOT be operated without the covers. Do remember to install the inner and outer lids in case of leaking water. Please use the measuring cup included to add water below the Max line. Do not add water while the diffuser is working and do not use warm or hot water. Please use 100% pure water-soluble essential oils for durability. 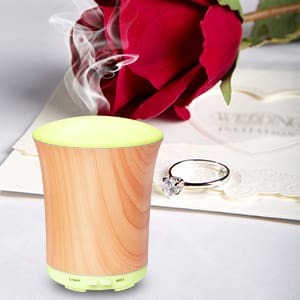 💎【Wood Grain Aroma Diffuser】Natural wood grain style to this diffuser,a great addition to your aromatherapy,and works great for your office,bedroom.Works with 100% natureal essential oils,which help to improve sleeping and does wonders for dry nose in the night. 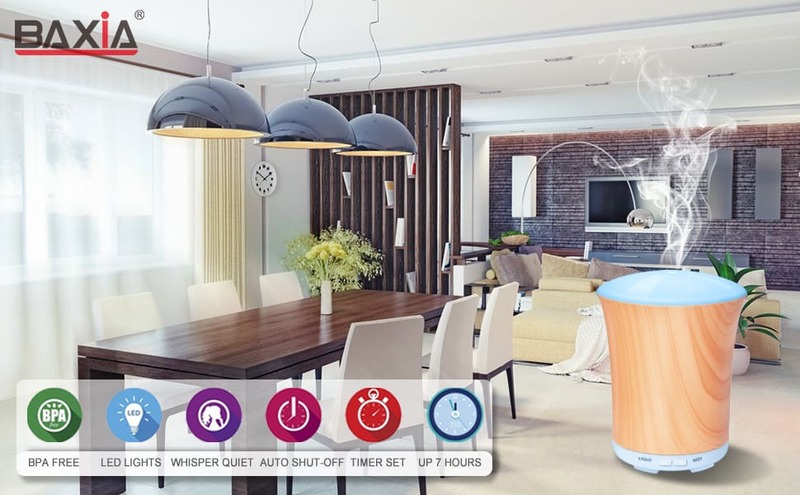 💎【Super Quiet Ultrasonic Diffuser】 Aromatherapy diffuser adopts ultrasonic technology that provides whisper smooth mist and pleasant aromas to create a calm, relaxing environment, 10 hours work time,perfect for kids for a whole night sleep. 💎【BPA Free Waterless Auto-off Small Diffuser】Made of polystyrene, BPA free diffuser is automatically poweres off when water lever is too low. 💎【2 Light Mode 2 Mist Mode】8 color light changes automatically or be set match your mood or decor of your room.Mist runs with intermittent (mist 30s on/off) or continuous mist . 💎【100% Safety And Guarantee】BPA Free, made from high quality PP/ABS material, no risk for you, With CE, FCC and RoHS certified or approved, we promise a 30-Day Money Back Guarantee and a 90-Day Limited Product Warranty.